What is the GDP of Brunei Darussalam? What is the amount of rainfall in Brunei? What is the maximum and minimum degrees over the last five years? How many teachers are there in Brunei? What is the value of our exports? Or our imports? How many Dewan Bahasa book members are there? How many criminal cases were handled by the police? What is our road casualties? How many dentists are there? Or Doctors? Or Nurses? How about pharmacists? What is the leading cause of death in Brunei? How about the top 10 leading causes? 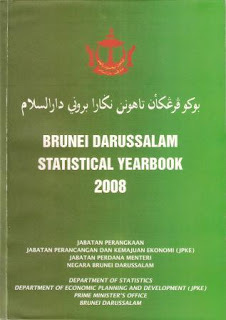 This green book produced by the Statistics Department of the Economic Planning and Development Department can tell you all those statistics and many more other stats that you ever want to know or not want to know. This is the most useful book if you ever need to do a time series analysis of any data. 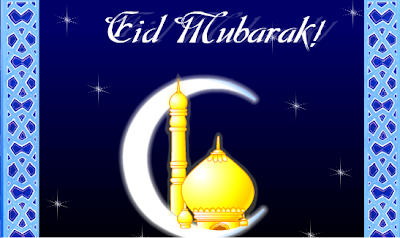 Two of the most important Islamic holidays of the year are Eid-ul-Fitr and Eid-ul-Adha. Brunei as the rest of the world is celebrating Hari Raya Haji or Hari Raya Korban or Eid ul Adha. 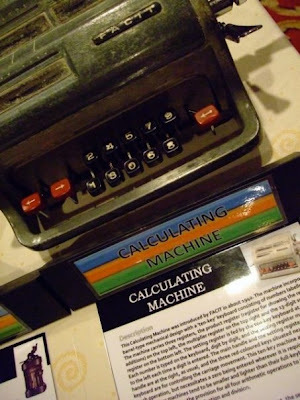 Do you know the history behind it? We know Hari Raya Eid ul Fitr or Hari Raya Aidil Fitri as we say in Brunei marks the end of the long fasting month of Ramadan, Eid-ul-Adha marks the end of Hajj, the sacred pilgrimage to the holy city Mecca. Also popularly known as the Festival of Sacrifice, this Muslim holiday Eid-ul-Adha commemorates Nabi Ibrahim’s unselfish act of sacrificing his own son Nabi Ismail to Allah. Not many things can make me go gaga. But the sight of this stamp on ebay certainly does the trick. This $5 stamp overprinted by the Japanese during the Second World War is worth a fortune. I tell you it's a fortune. At the moment, the opening bid for it is US$1,099.95 and so far no one has bid. But if I know the ebayers, wait till the last minute, someone will snap this up. This is the other one also on at the same time. This 6 cent red overprinted Japanese occupation is currently open for bidding from US$699.95. The last time I tried to bid for this, it disappeared at around US$700+. But that figure is now the starting pay. If you don't want to buy any other Brunei stamps, then get these two. You will not regret them. 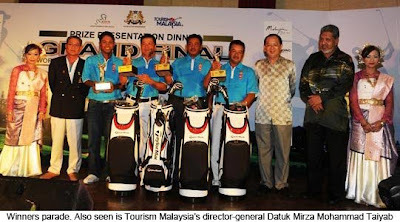 JOHOR BAHRU: Brunei team, Lapor Po Tiger blazed the course on a very wet week at Tanjong Puteri Golf Resort to emerge as winners in the grand final of the World Amateur Inter Team Golf Championship (WAITGC), from November 3-5. Powered by the sultanate’s best known amateur golfer, Seruji Haji Setia (0) and backed up by Pg Adam Pg Hatan (0), Dennis Koh Kheng Siang (8) and youngster Sanjok Moktan (3), Lapor Po Tiger combined for a three-day total of 55-over-par 703 at the 6,454-metre, par-72 championship course, winning the gross title by six strokes. 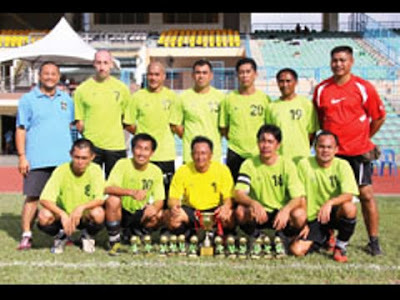 KOTA KINABALU: Mohd Brian Iman Abdullah Bothwell scored a spectacular goal in sudden-death extra time to help Brunei Veterans retain the Borneo 7s crown for the second successive year. Brunei Veterans, made up of Brunei ex-national players, defeated MX10, virtually the same side that lost the final last year, albeit that last time out they played under the Lecoq FC banner. Yesterday, it was a closely contested affair with Brunei Veterans drawing first blood through Mohd Brian Iman’s opener as early as the third minute. But MX10, who were strengthened by almost all ex-Rhinos with the likes of Bobby Chua, Harun Laban, Andrew Laban and Suharmin Yusof, found the equaliser when ex-Rhinos’ skipper Jelius Ating nodded home in the ninth minute. Throughout the last 10 years from 1999 to 2008, our local production has increased. The Agriculture Department has been slowly making local rice production efforts meeting the target of if I am not mistaken 20% of self sufficiency or something like that. That was not good enough and though the efforts of 2009 has been much more and has led to the new target of total self sufficiency in rice. 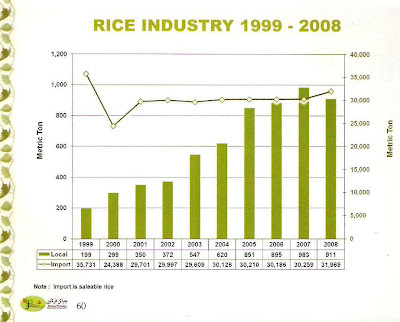 Even from 1999 to 2008, we can see the local production increased from about 200 metric tons to about 900+ metric tons. My spare time this week has been taken up calling up some of Brunei's athletes in order to complete my article on Borneo Games. I asked a number of people for names and my Minister gave me this name - Cikgu Haji Abdul Razak bin Bongsu. Finding his contact number was one of the easiest. Two of his children are engineers with the Public Works Department. When we finally talked to each other, I discovered another whole world. 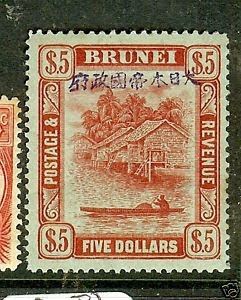 When I was a student in Singapore in the 1970s, anything about Brunei always excited us. The lowest hill in the world then, which was a tiny bump somewhere in Shell's golf course. That got a mention in the Guiness Big of World Records. 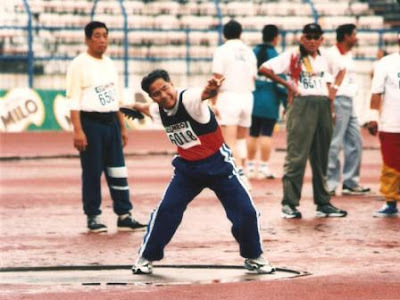 And the biggest story (to us students in Singapore) was an athlete Aloysius Sibidol winning world records for discus and javelin throwing. You probably are saying to yourself, huh??? Yes Sibidol established world records - in his age group. He was a veteran athlete. The Managing Editor of Brunei Times asked me to write an article about the upcoming Borneo Games. This is not an easy subject to write. You see, for most of the articles I have written, I have practically all the reference books and other reference articles somewhere in my library. So I generally am able to write most things about Brunei but give me a topic on sports, my mind will be unable to function. 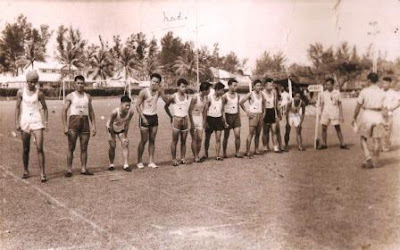 Anyway after a few quick checks on the internet which yielded very little but sufficient to go on, the first one was actually held in Brunei in 1954. It was at SRC in Seria. 1954 is not a good year. Borneo Bulletin has yet to go live then and practically everything was in Seria because that's where the British government really is. Not much was in Town. The first 5 year RKN was just kicking off. Muara Chinese would remember this. 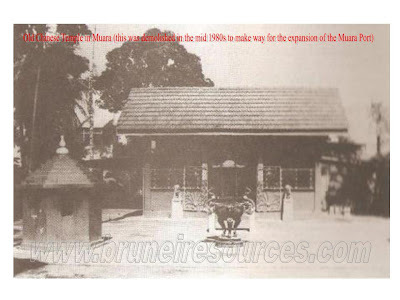 This was the old chinese Temple in Muara. This was eventually demolised in the mid 1980s to make way for the expansion of the Muara Port. A couple of months back, one of my junior colleagues took this photograph from his office. He has a nice office on the sixth floor of the MOD Building. That office overlooked the Highway and the airport as well as the huge canal flowing next to the highway. We have actually taken a boatride along that canal all the way from Kampong Ayer. When he first showed me this photograph, I was not sure what I was seeing. But when I cropped up the photograph. See, if you can recognise the animals. Caught me by surprise too. I did not realise that there are otters living in our rivers. That means that the Brunei wildlife is more varied than I thought and to see a family of otters which honestly I have not seen in Brunei other than watching them on television even surprised me till now. That really means we have to take care of our environment. We don't know what else is there that we inadvertently destroy in our haste to modernise. Yesterday during the 100 Years of Modern Land Administration Symposium, also held on the sidelines was a small exhibition of previous land related items. These are the cadastral equipment used to measure the size of land etc and also related old documents. Today will be held a special symposium to mark 100 years of modern land administration in Brunei. It will be held at the Kiulap Plaza Hotel. Land Department itself is not 100 years old. It was formed in the early 1960s. Prior to that, it was the District Offices with special District Land Officers working in the district offices that determined whether or not you could have your land application approved. So the symposium is not celebrating 100 years of Land Department but 100 years of modern land administration - or rather the Land Code which was enforced in 1909. Before the land code of 1909, all land was either Crown Land (Kerajaan) or appanage land (held by high ranking nobles who were awarded "sacred" titles by the sultan) (Tulin), or private-heirloom land (held primarily by high-ranking nobles) (Kuripan). Today any land not under private title is state land. Only citizens are allowed to own land. 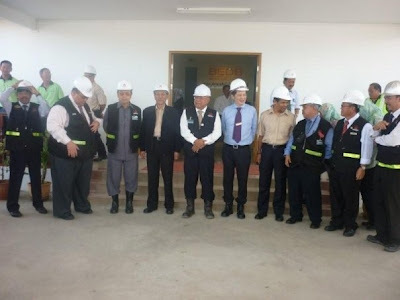 Yesterday morning, I accompanied my minister to visit the housing project conducted by BEDB at Pandan 10 in Kuala Belait. It was a working visit to see if there is anything new that our own Housing Development Department (HDD) can learn from it as well as keeping an eye on the project as the houses will form part of our housing stock soon. I remembered and tracked down an old BEDB press release about the cost of the houses. This is what it says in February "According to the BEDB’s infrastructure division, the cost per house in Bina Puri’s tender price is lower than for previous contracts awarded under the National Housing Scheme as a result of greater efficiency and economies of scale. “There will be savings for the government in terms of both time and money” said Mr Geoffrey Shim, Senior Executive Engineer with the BEDB." How many people remember this $100 note? Not many I am sure. All these while, all my other notes collection was growing, I only had two pieces of this $100 note. On the internet too, especially on ebay, this is rarely available. On the current ebay, there is one currently available note with a price of about US$260. I was quite surprised the other day when my nephew said someone deposited a few pieces. I rushed to see him and saw 6 of these notes in varying condition. The worst was badly folded but the best was in the EF category. If you managed to get hold of one, keep it. It may not be worth as much as the Begawan note but I am sure that will change. You just can't find these notes. This is one of the least remembered paper money that Brunei had ever produced. It was produced around 1988 to 1990. 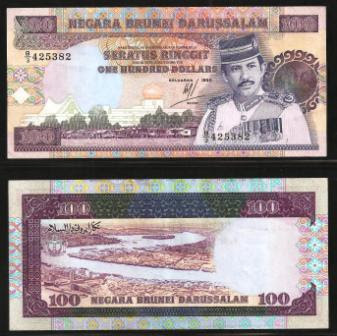 Many people remembered the older $100 of Sultan Omar Ali and of the earlier Sultan Hassanal Bolkiah. Those two were the large notes. Those two were replaced by this $100 notes. 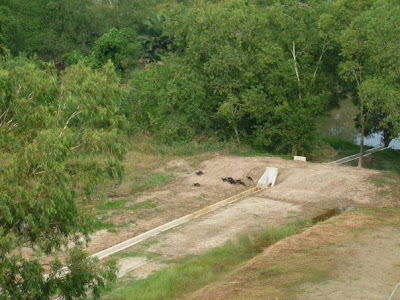 Ensuring domestic food security and developing a viable export sector are at the heart of Brunei's efforts to establish a strong commercial food processing industry, though the country has to balance its staunch commitment to environmental protection with the need to achieve self-sufficiency in basic staples. At present, Brunei Darussalam's agriculture only partially meets the country's food needs, with a small contribution to both employment and the economy, something that may well change in the near future. Last year, the total output of Brunei Darussalam's domestic food sector was just $158m, though under a new strategy developed by the Department of Agriculture this is to increase to $430m in 2013 and $1.9bn by 2023. While the strategy aims to improve yields from farms, the emphasis is on growing the agri-industry. You don't have to go to college earn a decent living. Some professions pay good salaries without requiring post-secondary schooling. Here's a list of top-paying jobs requiring little schooling, and their median annual earnings as of 2006, using the latest data available from the Bureau of Labor Statistics. Keep in mind that these jobs have their own challenges and often require some type of specialized schooling - sometimes on-the-job training. Tun Teja commented in the Comment Box a few days ago about how he just came across this book. In fact this is not a new book, this book has been around since the third quarter of 2007. I bought it in Singapore last year for a would you believe it price of S$193.81. I checked on the internet this morning, the price is much lower now. Barnes and Nobel is selling it for US$56.21 (S$78.86), Amazon USA is selling it for US$79.00 (S$110.84) and Amazon UK is selling it for GBP43.12 (S$98.96). Shipping and packing is of course extra. This book is written by Datuk Harun Abdul Majid, one of our local businessmen. This book arises out of his dissertation when he was doing his Masters at King's College in London and he carried out his research at the Department of War Studies there.